Every morning C's homeschooling begins with circle time which includes seasonal songs, verses and hand movements. Then before we jump into whatever activity is set for the day (ie. today is Thursday so we had painting day), we do something C specifically requested when we made her "What I want to learn in home school" list - the weather. As I am sure you can gather, this is not something done in the Waldorf kindergartens but I want to make sure that on top of following Steiner's educational plans, I also include things that C is really interested in. After all, most of the best learning is child led. 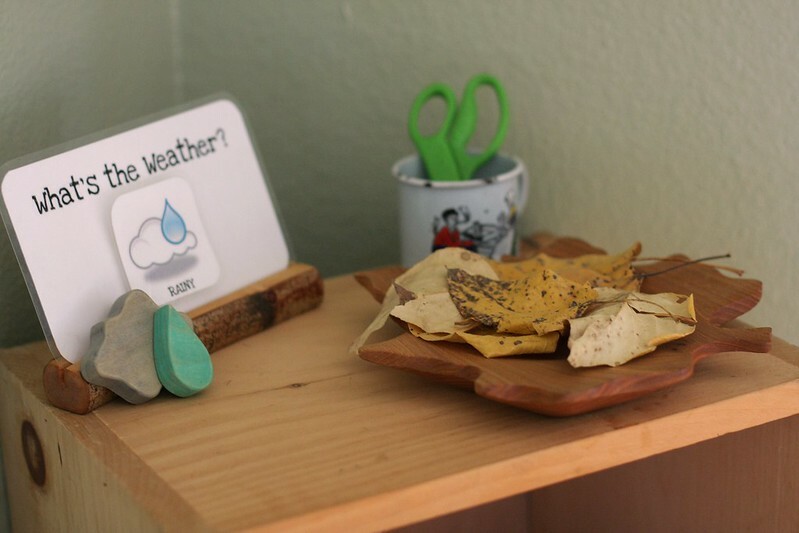 We walk into our dining room and C pulls our weather display and it's bag full of wooden and paper symbols off of the top of our school shelf. She then lines them up in our windowsill so that she can get a good look at what's going on outside (we also step outside to feel the weather if it's not pouring buckets down on us). She likes me to ask her, "What's the weather?". I happily oblige. Then she narrows it down (with the help of little brother) to which wooden and paper pieces best fit what she sees. 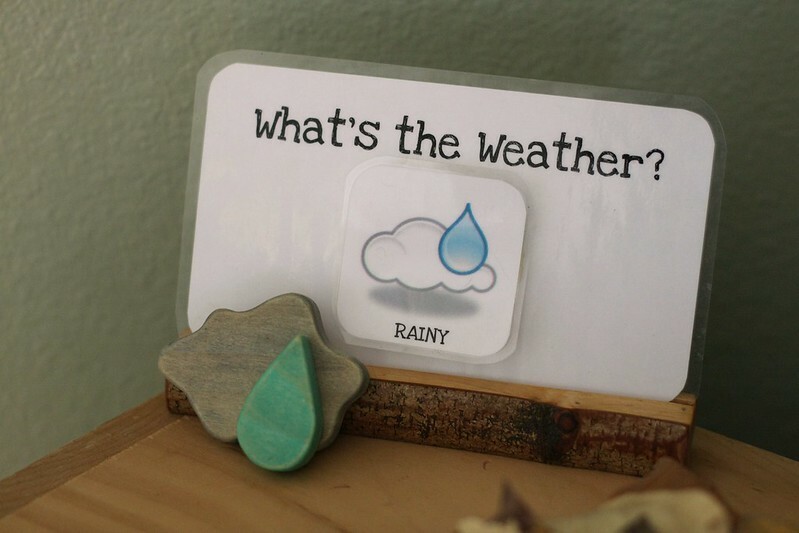 She attaches the paper one to the weather card and then puts it back on the shelf. Then she places the wooden pieces up with it, steps back to admire her work and beams with delight. It's a quick but fun introduction to the weather around us while providing C with something she was wishing for. We don't go into the science behind it all and just leave it simple and sweet, "Today it's cloudy", but that is all she was ever really asking for. The weather the past month or so has been going back and forth between cloudy and rainy. That's Portland for ya! It really doesn't seem like we get too many days of sunshine so C and I are thinking of keeping track for a year to count just how many we do get. That just might be a very worthwhile project for us both! The details: I was inspired by this weather set from Armadillo Dreams and a post my friend Joy did awhile back. 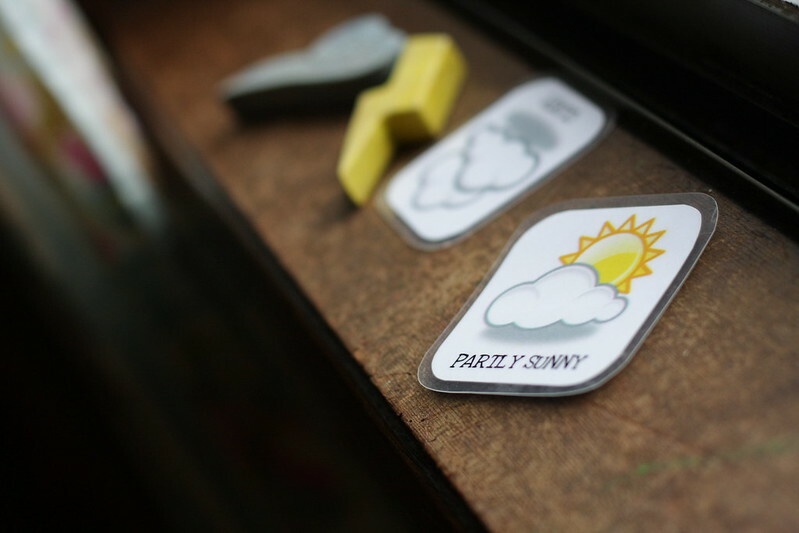 We printed out the free weather cards from here and then I laminated them to help them survive the grabby claws of Little L and then put velcro on the back of each one. We use a branch card holder to hold our display (you can find similar ones here or even make your own). I think that covers everything. Don't be shy. If you have any questions ask away! Thank you so much for all your kind votes and help with the top 25 creative moms. You placed Frontier Dreams in the top 10 coming in at spot 9!! I am happily sandwiched between two fellow Waldorf Mama blogs. The three of us cheered each other other through it all proving that community is a blessing and always a priority and that the golden rule lives on. Thank you!! p.p.s - Anyone recognize the post title?? Does this give you a hint?